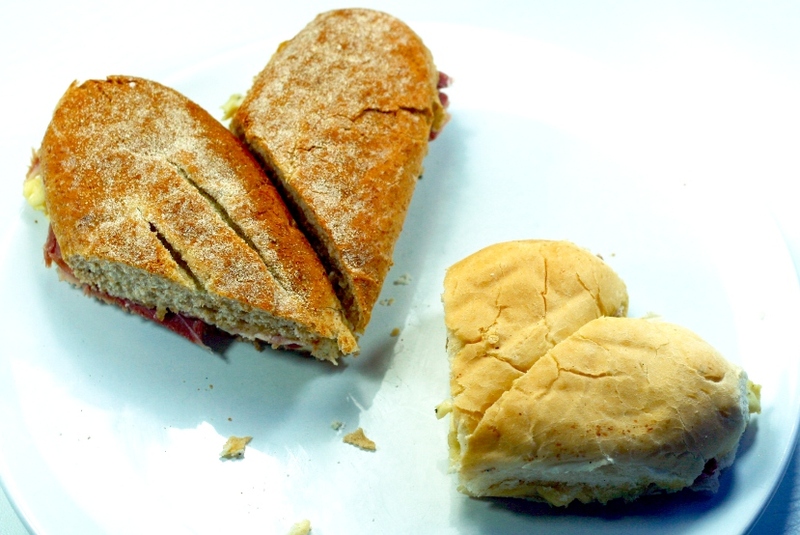 It’s Valentines Day next week, and so I thought I’d run through some suggestions if you fancy being creative in the kitchen for your loved ones. Whoever you’re cooking for, young or old, you don’t want to get so knee-deep in recipes that you end up spending all your time in the kitchen – that’s DEFINITELY not romantic – so all of these suggestions are simple and quick, allowing you to indulge and be indulgent, without sacrificing your whole day. After exhaustive (10 minute) research via Twitter earlier this week, I decided to go with Breakfast recipes – a little out of the ordinary perhaps, but it then frees up the rest of the day for other fun stuff, instead of spending it slaving over a hot stove. A little sweet, a little savoury, a little bit of something to warm the cockles of your heart. Cut the sausages almost in half, leaving 2cm of one end uncut. Open out the two halves of the sausage and bend each half backwards until they meet. Fasten together with a cocktail stick. NB You need the slim frankfurters (probably to be found vacuum-packed, in a chiller somewhere near the cooked meats in the supermarket). Tinned or jar’d frankfurters are too thick and will split when you try to bend and shape them *eyes heaped bowl of 18 broken test sausages in the fridge*. Once you’ve got your heart shapes together, you can choose how to fill them with egg. You don’t HAVE to fill them with egg – you could use tomatoes or bacon or anything else breakfast-y – but the egg, once cooked, will hold the sausage in shape, allowing you to remove the cocktail stick without the sausage whiplash-ing back to its original shape. Whole egg – this is relatively straightforward, but can get a bit oozy if there are any gaps beneath the lower edge of the sausage and the baking tray. To try and keep spillage to a minimum, grease some foil with a little butter and fold it underneath and around the sausage heart shape, in effect making it into a little pan. Any egg that does seep out is thus contained, and can be trimmed off once cooked. Bake in a 160°C, 140°C Fan oven for 5-10 minutes until set. Remove foil and cocktail stick before serving. Scrambled egg – Whisking the eggs makes them more liquid, so the best solution for serving your heart sausages with scrambled eggs is to partially cook them before filling, then finishing them off either in the oven or in the microwave. Cook the eggs until half cooked then spoon mixture into the sausage shapes. Bake in a 160°C, 140°C Fan oven for 5 minutes or for 30 seconds to 1 minute in the microwave. Remove cocktail stick. Fluff the surface with a fork if necessary before serving. These aren’t heart-shaped, but they’re almost unbelievably easy to make and look so cute, I think they’ll go down a storm. 1 sheet All-Butter puff pastry – using the ready-rolled makes this even speedier. Unroll (or roll out) the pastry to a flat rectangle approx. 5mm thick. 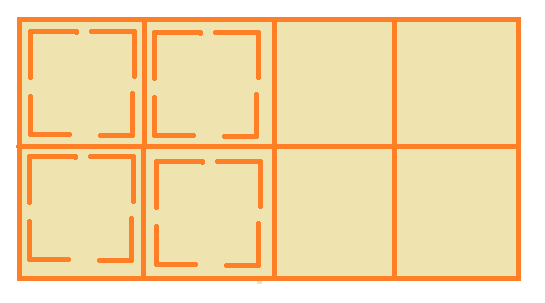 Using a sharp knife, make cuts in the corners of each square as per the diagram below. Don’t try and cut around the corner – insert the point of the knife at the corner and draw it away from the corner to make the cut. Repeat for the other side, then repeat for the other three corners, leaving a small (1-2cm) strip of pastry at the middle of each side uncut. To complete the pattern, take the outer corner of the pastry and bring it into the centre of the square of pastry and press down firmly. When all four corners have been brought into the middle, they will have formed the four ‘petals’. Put a small blob of jam into each petal. Put pastries onto a baking sheet lined with parchment (the jam WILL bubble and ooze) and either spray lightly with oil or glaze with the beaten egg. Bake in a 220°C, 200°C Fan oven for 8-10 minutes. 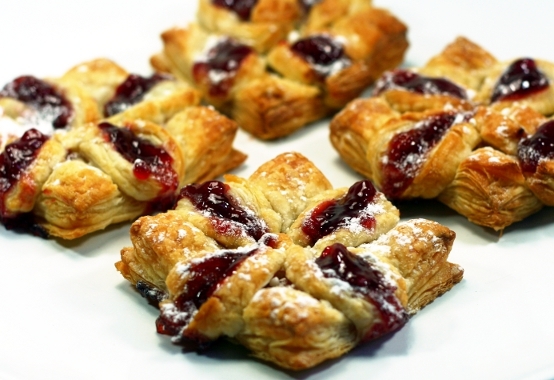 Dust pastries with icing sugar and ‘top up’ the petals with more jam if necessary. Just as easy as the above pastries, you could even use the one sheet of puff pastry to make both if you’re not catering for large numbers! 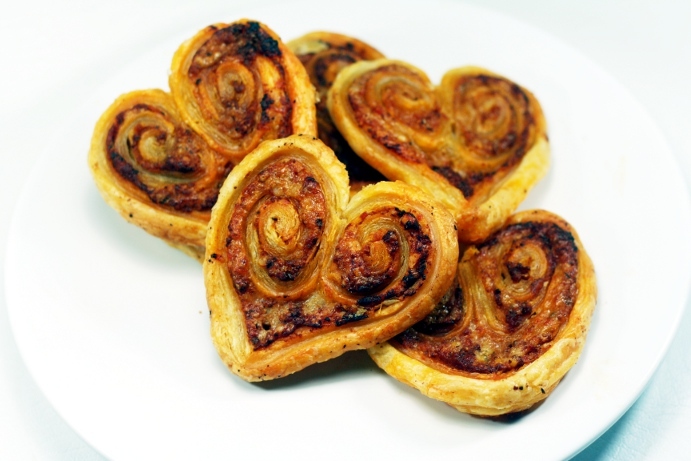 Your choice of filling, sweet or savoury, is rolled inside puff pastry and then chilled and cut into slices which bake into crisp and flaky, heart-shaped bites. Sweet filling: Granulated sugar & flavouring – I used freeze-dried, powdered raspberries, orange/lemon zest, ginger, cinnamon, nutmeg also work – whatever you feel like. Add the filling. If sweet, mix your flavouring with the sugar and sprinkle over the pastry. For the savoury filling, spread the pesto over the pastry and then sprinkle with cheese. Starting with the left-hand side, roll the pastry to the middle (like a swiss roll). Repeat with the right side. Press both sides together and shape the point of the heart. 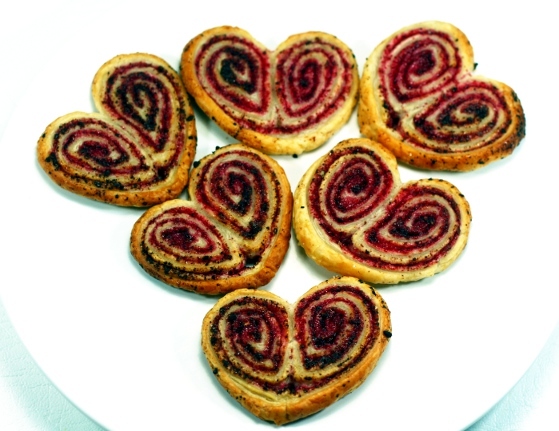 Remove the rolled pastry from the freezer and cut in 5mm slices and arrange on a baking sheet lined with parchment. Bake for 8-10 minutes until crisp. For that minimalist breakfast, or for a packed lunch. Use an oval roll (finger rolls are fine) and, once filled, cut it on a diagonal. The two halves can then be rearranged as in the picture to make the shape of a heart. Once again you’ve given me some great no-fuss ideas that look a lot more complicated than they are! Thanks! Great ideas and wonderful pictures! Thanks for the inspiration! Hi Mary-Anne, I made the Heart Eggs (scrambled) for my boys 14, 16 and 51! on Tuesday, they went down a treat – thank you! Judi. PS: Aren’t frankfurters delicious? I’ve always scorned them for being full of rubbish and couldn’t believe it when I saw on the packaging that they’ve got such a high pork content, better than many so called premium sausages.